DJ LaJedi, Official Starfleet Commander and global ambassador of Detroit hip hop, has a new mixtape released with World Hip Hop Market and Nomadic Wax called “World Hip Hop Women: From The Sound Up”. The project is a monumental gathering of some of the finest female emcees from around the world in one mixtape, converging languages, cultures, strength and beauty over hard hip hop beats. The official press release from World Hip Hop Market and Nomadic Wax has arrived and is reprinted below. The link for free download is here. Atlanta, January 21, 2013 – Hip Hop Culture is nearing its fourth decade of existence. Throughout those 40 years, main stream hip hop music has tended to be male dominated, with some notable exceptions. Despite what we might see on the surface, the hip hop community is in fact filled with amazing female artists from all over. If you are asking “where are all the female MCs at?”, then you just aren’t looking. 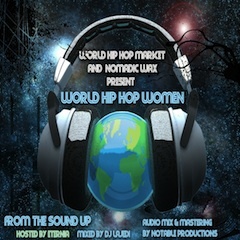 World Hip Hop Women: From The Sound Up is the latest mixtape project from Nomadic Wax and World Hip Hop Market. The brainchild of Detroit’s DJ LaJedi and World Hip Hop Market founder Greg Schick, the new mixtape seeks to highlight the female voices and causes that are always present but less often heard. Featuring artists from 15 countries, the project joins Iranian MCs living in Washington, DC, to Zimbabwean artists in the “Sunshine City”, Harare. It celebrates both Cuban heritage and the Palestinian struggle together, alongside exclusive Spanish dancehall, and new dubstep sounds of South Africa. World Hip Hop Women are fierce emcees spittin’ bars that transcend language barriers, cultural differences, and gender bias, expertly mixed together by DJ LaJedi, sound provider for Detroit legend One Be Lo, an Official Starfleet DJ and founding member of The Foundation of 5E Gallery.